We invite you to contact us today to discuss your dental care. Please don't hesitate to call us at (425) 825-8800. WELCOME TO Beetham Family & Cosmetic Dentistry! At Beetham Dentistry in Kirkland’s Totem Lake area, we take great pride in offering comprehensive and individualized treatment to our patients. We sit down with them and carefully go over their options. As a result, we are able to understand your unique dental needs and goals. Our experienced and highly trained dentist and dental team embrace the latest technology dentistry has to offer. We regard our patients as extensions of our family. Your dental experience should be as comfortable and pleasant as possible. 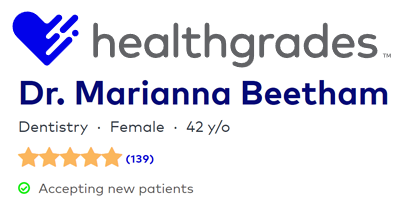 As a patient of Dr. Marianna Beetham, you can expect to be treated with the respect, integrity, and compassion you deserve. For your comfort, we offer cable TV in every operatory during any procedure, and happily, offer oral sedation for patients who experience dental anxiety. And, because we know many children fear a visit to the dentist, we reward them with small gifts for their bravery! Beetham Dentistry works with most dental insurance providers and offers payment plans and discounts for patients who lack insurance. It is our pleasure to welcome you to our family of patients. Because of this, it is our mission is to cultivate and nurture a strong, long-lasting relationship with you and your family. Please give us a call today to schedule a complimentary consultation with Dr. Marianna Beetham at our convenient Kirkland dental office. We do our best to accommodate your schedule and are one of the few dentists open on Saturday in the area. A lifetime of dental health starts here! Dr. Marianna Beetham is passionate about creating healthy smiles, educating patients about oral care, preventing big problems before they start, and making people feel beautiful with both simple and advanced cosmetic dental procedures. She believes not only in maintaining technical excellence, but also in providing a comfortable, caring, and nurturing dental environment for her patients. Inna provided the best cleaning I have ever had at the dentist, she explained what she was doing and she is very personable, friendly and easy to talk with. My compliments to her. Every time I visit I feel like I’m in good hands. I would love to especially mention Dr. Beetham’s sweet personality. When I feel worried, she’d always help me to feel calm. When questions arise, Dr. Beetham will go the extra mile to make sure her patient understands and have the knowledge of procedure. Over all great staff and wonderful experience. I am very happy to say that this was best filling appointment that I have ever had. Even though I was very nervous at first, the shot was easy and painless. During the appointment the dentist explained to me everything that was happening which put me at ease. I also like the friendly staff. They are fun and caring. Everyone was friendly and helpful and the waiting time was minimal. Thank you for seeing me on such short notice. I appreciate your honesty and integrity. It really means a lot to me. I will definitely recommend you to friends and relatives who live in the area. Beetham Dentistry is here for you, especially during emergencies. It is very important to be prepared in case you have an emergency. Even though we wish that they wouldn’t, emergencies happen. We are pleased to provide you with the latest technology. Technology has entered the dental profession just as it has in every facet of life. Great advances have been made in almost every area of dentistry, from the way we examine teeth to the way we restore them.